When I was little, I had a conversation with my dad that I distinctly remember. It was about explaining the concept of "left" and "right" to a Martian, and even to ourselves as bi-laterally symmetrical beings. I was pretty young, so I was all OMG LEFT IS THE ONE ON THIS SIDE. I'm sure he laughed. But it got pretty complicated pretty fast, actually. What if the Martian is a TRULY symmetrical being? Just a blob of something? What will left mean to it? What is their reference point? Even with bilateral symmetry it's weird to think about. I should really have had a Salt Lake City resident handy for this conversation, since they have the insane street system (stifle yourself if you're yelling out - it's easy! It's a grid! Right now. Stifle. I'm serious. STIFLE.) in which every street name is south or west or north or east, but unless you're from there you don't know what you are south, west, north or east OF! When they're all like "oh, it's easy, it's the TEMPLE" you yell at them BUT I DON'T KNOW WHERE THE TEMPLE IS SO HOW DO I KNOW WHERE I AM? You don't. Until you go back home. Where things make sense. But really - take a moment to explain left and right to yourself right now. Better yet - subject a small human to this thought and break its tiny brain forever. Salt Lake City navigation for foreigners is exactly how a Martian will feel when you tell your little blobby friend to turn left. Left in reference to WHAT exactly? Color is the same way - how do you communicate what a color is to a Martian? You're welcome for the insane brainworm I've now given you that will lead you to question everything in terms of how it could be explained to a Martian. So this morning I was on an insane quest in the car and I was wondering how I would explain driving to a Martian. This is what I came up with. You get into a 6,000 pound metal box and you make it go fast, slow, turn and stop with your arms and legs. It's pretty weird when you think about us all maneuvering 6,000 pound metal boxes around with our arms and legs all day every day. It's quite a feat and I think we take it for granted, honestly. The amount of coordination it takes to do that without killing yourself is astonishing. This wasn't a TOTALLY squirrel thought though - on the way to my quest, on the lightest Austin traffic day of the year - Good Friday - someone managed to flip their car on a nearly empty stretch of our southernmost expressway. That's what started the Martian avalanche in my brain. So you're welcome. It's my dad's fault. Sometimes I feel like that's what it's like to explain stamping to people. It's very hard to tell people what I do. Let's take classes. "I teach stamping classes" to most people sounds like "I don't know what you just said." People first think of postage stamps. And then they feel sorry for me, locked away in a room looking at postage stamps under a magnifying glass in a dusty library. Then if you modify it with papercrafting, they think you are folding swans or gluing macaroni to construction paper. It's just not easy to describe. To humans, much less to Martians. That's why it's good to have a tribe. Your tribe speaks the same language and understands you. Thank you, tribe. Now explain left and right to me. I'm filling in for Audrie on the Inspiration Challenge on Splitcoast this weekend, and I thought it would be fun to feature a local friend and watercolor inspiration - Kathleen McElwaine. I met Kathleen through a friend that I worked with at an image-based startup a few years ago. He was a very creative person, and introduced me to her when she was developing her portable watercolor kit you can see here - she wanted some feedback on it. I fell in love with it and it's what I take to all retreats and mobile painting expeditions like holidays with my family or at my sister's community garden. It has everything you need to make watercolor portable. Genius. It was this kit that got her through her long commutes from Georgetown to her work at the University of Texas, and it's how she earned her nickname - the bus painting artist. Her work is now licensed on lots of different textiles, sold in local stores and online, and she has a studio in Georgetown where you can come paint with her. She also has step by step watercolor instruction books in her Etsy shop. She is an awesome lady - kindhearted and creative, and her art has this whimsy I just love. So I chose her for this week's challenge - look through her prints and be inspired. Use keyword or hashtag #IC538 when uploading to Splitcoast, Instagram, etc. I, unlike Kathleen, can't draw, so I started with a stamp image and tried to use watercolor and pen in a way that reminded me of her. 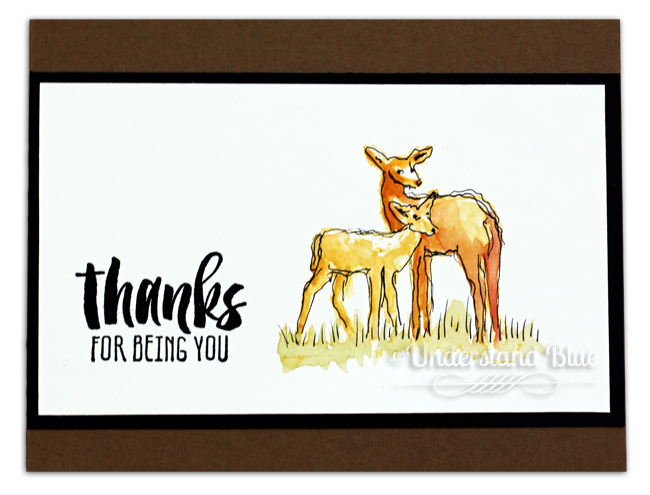 These deer from In the Meadow are so, so sweet, and such an iconic Texas image it was perfect for a tribute piece. I stamped the image in So Saffron with my mini MISTI, colored with this Koi Watercolor, and outlined with this marker. I hope I did her style justice. I did a quick video for you of the process - this was truly a 5 minute card. And I think the less you fuss over things, the better they come out. So big thanks to Kathleen for being our inspiration this week. Come play along if you want. If you are a NEW challenge player this week and reference this blog post in your Splitcoast gallery post, I will send you a surprise in the mail :). PS - my friend Dana bought me the COOLEST thing - I'd been seeing these online and it was like she read my mind. You MUST have one of these! I store my glue upside down in it so it's ready to use. It sticks to any surface and has a ruler on top - they also have them for drinks and they have mini ones! - I LOVE it so much I might get a few more! It's called the Hobby Holster! It's a crazy heat resistant silicone and you wouldn't believe the way it grips your desk! And yes, it comes in turquoise :). The only way I know left from right is because left is what I use to hold a pen, paintbrush, fork...but then I can get lost in a paper bag, so don't ever trust me with directions!!! Especially not in Salt Lake City! What kind of brush are you using in the video? Hi Mary - thanks for stopping by! I'm using a Silver Brush - Black Velvet series - best brush in the world. So many items on this post had me rolling! The whole East/West thing came up again this past weekend as it does every time MN in-laws come to visit. It's hilly and curvy here, no such thing as any type of grid and it blows my FIL's mind every time. "so, town is East of your house?" sigh. Your card is gorgeous! Beautifully done! and he taught me to drive. so, he'd say take a right after the next intersection.. ( which I would do) then he would be like "no, I meant the OTHER right"
In Utah you use the mountain rangers to know which direction is east, west, north, south. This is how I navigated my whole life until I moved to Texas. Welcome to flat land with no sense of direction. Someone here would tell me a street name which meant nothing to me. I just wanted my number grid back. Thank goodness we have navigation now a days or I would have really been lost when I first moved here. My husband (when he was younger) could be laying down in a car and could tell which direction he was going....maybe he was cheating and could tell by the Sun, it it was north, south east or west....who knows. I still get confused when giving people directions to my house and have to look at my hands, now is that left, no, turn right......oh well. I still need to buy a misti....do you think I should get the smaller one or large one, which do you use the most???? I love your art work and always look forward to you next post and tutorial. Hey Louise! I'm the same way with the compass points - did he grow up in a prairie type environment like Texas? Does this thingy fit a heat gun? Not the size I have - it's not deep enough. Spoiler Alert - You Don't Need a Crockpot!